At 16.2m, or nearly 54ft, the Hanse 545 is a big yacht with all the features one would normally see on a million-dollar offering. 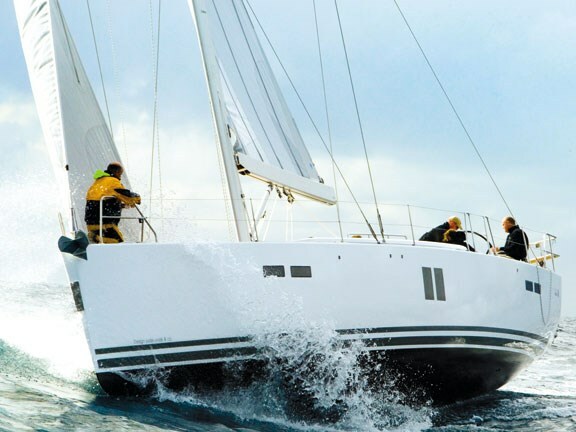 However, the basic sail-away package means this big bluewater cruiser is not so far out of reach of the young upwardly mobile couple or family. Cruising grunt comes from the 110hp Yanmar, which is connected to an optional folding three-blade prop. 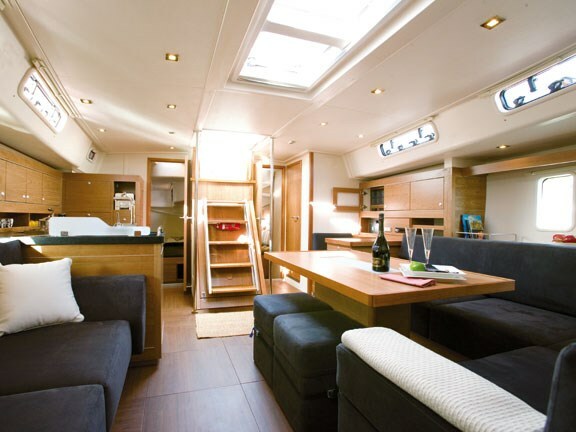 There’s also room for a generator above the engine and large fuel and water tanks below the living areas. Below deck two pairs of large vertical windows illuminate the main settee area and bring the view inside. The fit-out is clean and modern. 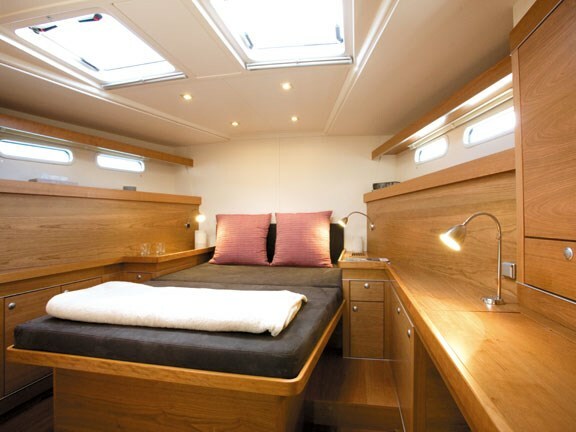 It’s all very functional, with an en suite main cabin in the bow with an island bed, and two aft cabins each with doubles. The communal head is opposite the galley with two fridges (200L in total), a microwave and a built-in coffee maker. Before we headed off on our test-sail along the coast from Pittwater to Sydney, we noted the superyacht features, such as a potential crew quarters in the bow and a "dinghy garage" in the stern. A 3.5m dinghy can be stored behind what turns into a brilliant bathing platform, but there is also room for other watersports gear here, too. Back on deck twin bowthrusters made exiting the marina pretty easy, although we had only light crosswinds to contend with. Given the high freeboard, the 545 may take some getting used to when greater windage comes into play. Yet it’s immediately obvious that even under motor she’s a spirited vessel. There’s a real surge of transverse thrust across the large single rudder and she tends to veer to port if you release your grip. It certainly needs a bit of muscle when helming, but the steering system is very direct and responsive. 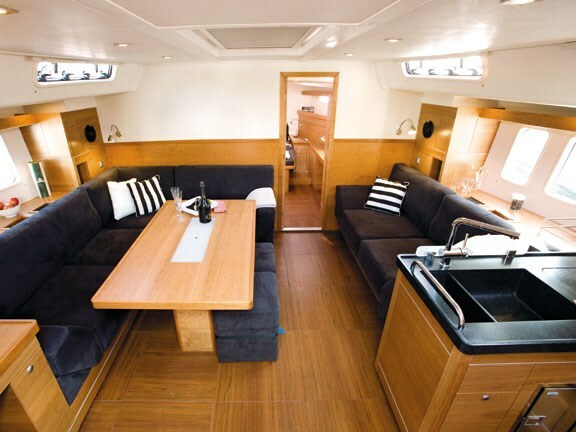 With room for up to 18 people for a day-sail, the 545 can double as a good party boat. But the keel might be the biggest problem for the stay-at-home big boater. Anything over a seven-foot draft can be a real pain, as you tend to find every sandbar in the harbour. 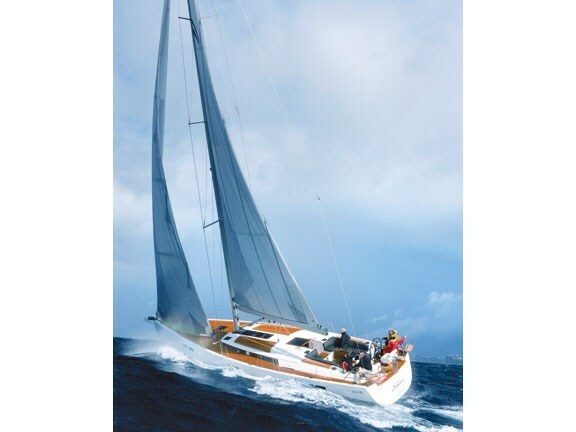 To balance the 24m mast and 156m² of sail area there’s a standard 2.8m (9ft2in) T-shaped keel. That’s a pretty big draft and, while appreciated on the open seas, will prove a challenge in the harbour. Although there is a 1.95m shoal-draft options, Peter Hrones, from distributor WindCraft, is adamant that the big keel is the best and safest for this yacht. Of course, when it comes to sailing a 50-plus-footer for a bit of fun round the harbour, they can be a bit of a handful. However, Hrones assures me a couple can sail this yacht on their own. Two 54 AEST electric winches make all the difference as the crew effortlessly pulls the vertically battened, furling main from inside the mast. There’s no need for shouting as running lines are hidden below the coach housing to emerge near the cleats, not far from the steering wheels. A total of 87m² of sail power is quickly out and the self-tacking jib unfurled. Holding it up is a towering 24.8m mast. 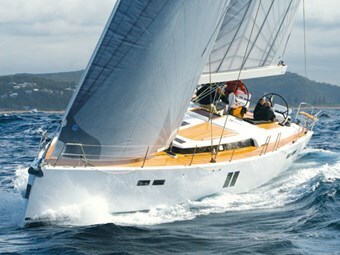 As I bear away in the calm waters, she powers up quickly to around seven knots. A squall with 20-knot gusts sees us quickly to 10 knots. The yacht feels balanced but at the same time frisky. 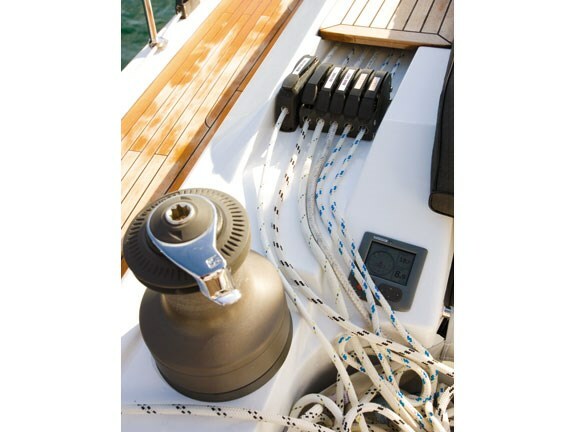 Hanses are designed and built for a self-tacking headsail and it works like a dream. 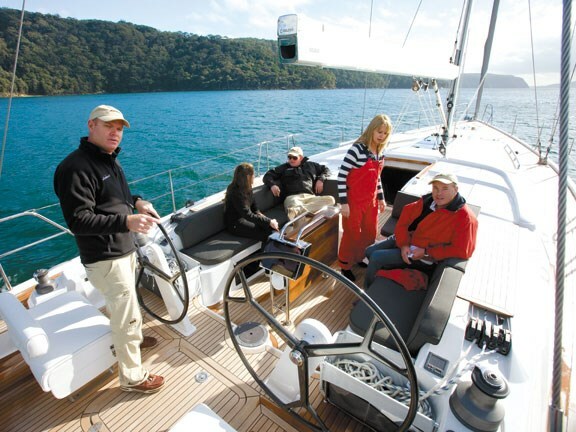 The vision for the helmsman is the best I have experienced on a yacht, and stand-alone padded helm seats and pushpit seats were comfortable additions. As we head out of Broken Bay, the weather is closing in, necessitating that the crew change into the serious offshore kit. There’s a strengthening southerly with wind gusting now up to 20 knots and serious rainsqualls. With full main and jib the Hanse 545 was on the edge at times and we had no problems getting speeds in excess of 11kts running close hauled at about 45o through a short swell. 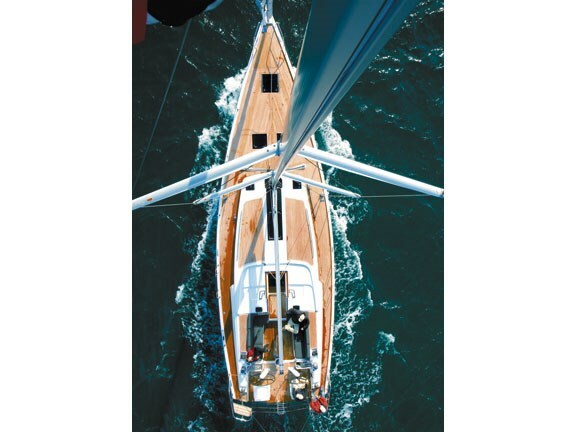 As the beamy yacht sails on a high lean when close hauled, the helmsman shifts to the side coaming to sit, then reaches down and pulls out a 45 percent foothold platform. This is an excellent feature when heeled over. The short seas did grab at the big, single rudder and, while controllable, the motion made for tired arms after a few hours. The modern, relatively flat underwater hull shape is easily driven but as with most yachts there was a bit of slamming punching into the sharp waves. When hitting speeds of more than 10 knots, showers of spray rained all the way to the helm. Meanwhile, the instruments in the cockpit were a tad small and therefore not in your face. The hull is constructed using epoxy-based vinylester resin that increases strength and reduces weight. Osmosis will not be a problem and, with bulkheads laminated to the hull and deck, we’re confident the 545 is a very safe and tough cruiser.